nolefan5311 wrote: Ok Seamus, I think there is only one issue holding you up. After doing a little bit more research into this, the only real issue I have remains the capital bonus. From what I can see, 5 of the 12 capitals will start neutral. This leaves 7 capitals as droppable; Beer-Sheba, Shiloh, Samariah, Adamah, Edreh, Mahanaim, and Arder. With only 4 required for the bonus, that leaves a 16% chance that a bonus will be dropped in 2 and 3 player games, which is just too high. You have a couple of options here though. The simplest is to code 3 of the above as starting neutrals, leaving 4 to be deployed at the drop. This drops the percentage to 1% in 2 and 3 player games. The other option is to code those remaining 7 as starting positions in the XML, giving a maximum of 3. It's up to you, but this will have to be changed before the stamp can be issued. That makes sense. 16% is WAY too high. I hate games where there are bonuses on the drop. I really like the idea of coding the remaining 7 as starting positions in the xml, with a max of 3. This makes the chances of a capital bonus on the drop 0%, and keeps them very much in play if someone does happen to drop 2-3 of them. Plus, it also then becomes V.J. 's problem since he'll be doing the xml. Thanks Nole. So with that being said, does it solve the one issue holding us up? if 7 capitals are start positions with a maximum of 3 each in 2-player games, then the 7th capital is put into the random pot for distribution to player 1, player 2 or the neutral player. there is therefore a one-third chance of player 1 receiving a +2 bonus for holding 4 capitals. if u deal with this by coding 7 capitals as underlying-neutral start positions, then 8-player games will start with 7 neutral capitals, which isn't ideal. while keeping the 7 capitals as start positions, how about changing the capital bonus to +5 for every 5 capitals? there is no chance of receiving this bonus from the start and it's big enough to encourage players to position themselves for or against it. let the levite cities start as n2 rather than n3. 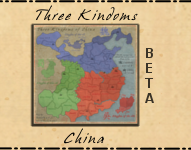 they're likely to remain untouched in many games if players have to kill 3 neutral troops for only a +1 auto-deploy. 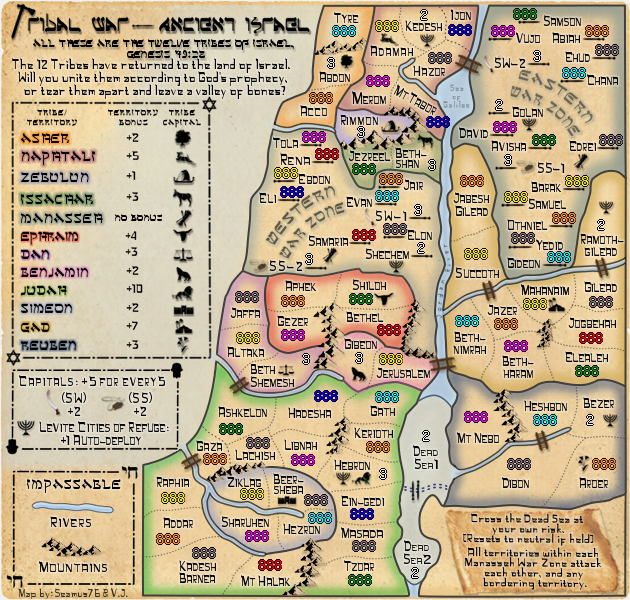 a further possibility is to have shechem and ramoth-gilead start as n1, to force some action in the war zones, though this has some minus points in unlimited-forts games. the name of the river: isn't it supposed to be river jordan, rather than jordan river? mark 1:5 And there went out unto him all the country of Judaea, and all they of Jerusalem; And they were baptized of him in the river Jordan, confessing their sins. Officially the Hashemite Kingdom of Jordan, Jordan is on the East Bank of the River Jordan. iancanton wrote: if 7 capitals are start positions with a maximum of 3 each in 2-player games, then the 7th capital is put into the random pot for distribution to player 1, player 2 or the neutral player. there is therefore a one-third chance of player 1 receiving a +2 bonus for holding 4 capitals. Thanks Ian. I think +5 for 5 capitals is a good solution. I'll update that for the next version. I also really like the 6 Levite Cities starting at n2 rather than n3. I don't think we need to force action in the war zones with some n1's, that should happen naturally, but could be something we rework during Beta as we see the games play out. As for the Jordan, I've seen it both ways actually, in even earlier passages than the ones you posted. I don't mind either way, maybe BluU can crack an egg of knowledge all over us. Either one is just a translation/interpretation of the original text. Jordan River (Modern American) - River Jordan (Antiquated British). I think this map is going for the old feel. Two options more for you. Remove the names as they are not territs or go completely biblical and call it Yarden. Once you've posted that update Seamus, we can stamp this for you. - Updated the Capitals bonus from +2 for 4 to +5 for 5. - Updated the Levite Cities of Refuge from n3 to n2, but left Hebron as n3 since it is also a Capital, and as such much be taken to give a player the Capital bonus and a +1 auto-deploy, so it's more valuable then a regular Levite City. Working on the small map. Looks good Seamus. It's come a long way. This is the last call. 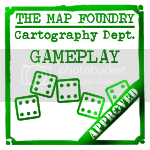 This map will receive the gameplay stamp in 48 hours if no issues are brought up, so if you do have any issues, now is the time to make mention of them. Wow, great call Ahava. Not sure how I made that mistake. I'll have it corrected for the next update, which should include the small version, and is why it's taking so long to post. 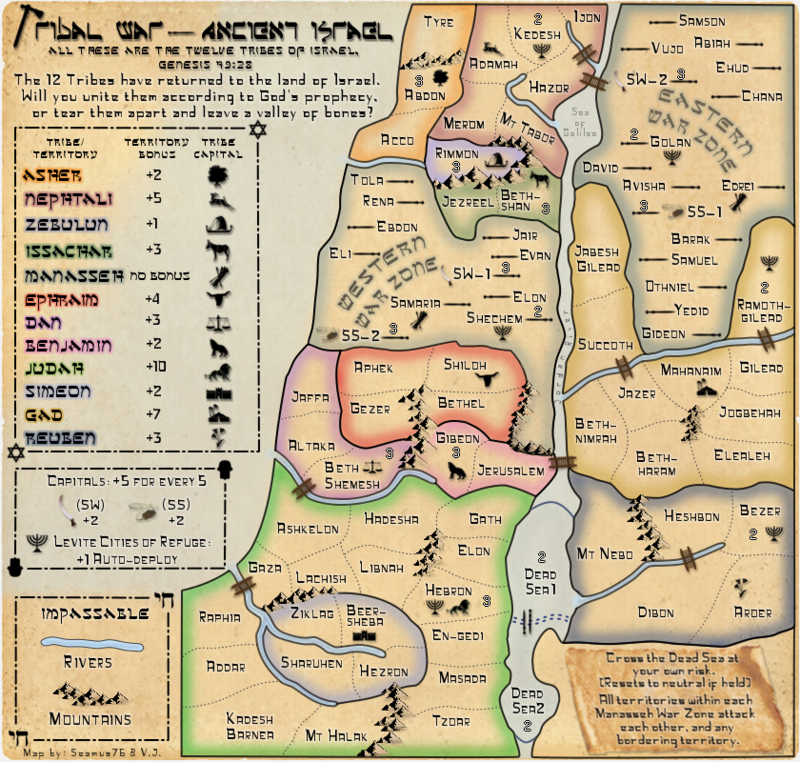 "En Gedi" should be "Ein Gedi"
And you have 2 terits that are both named "Elon" one in the green Judah bonus area, and the other in the Western War Zone area. There do appear to be a couple of grammatical changes, but that won't hold up the GP stamp being issued. Congrats Seamus...onwards and upwards! Thanks so much! Working on all of those changes now. My quick question of gramaticalness (is that a word? lol) The Jordan River... is often referred to as "the River Jordan" yes? Especially when referred to in the biblical sense. RedBaron0 wrote: My quick question of gramaticalness (is that a word? lol) The Jordan River... is often referred to as "the River Jordan" yes? Especially when referred to in the biblical sense. At the end of the day it doesn't really matter to me that much. I do think it's a little funny that of the entire map this one almost insignificant lable has been one of the focal points of the comments recently. If that's the only graphicalness (lol) issue then I'm pretty happy with myself...insert back patting here. Its just the first thing that popped out at me.... I'm sure I'll find more stuff when I run it though the ringer. This update includes the small version. 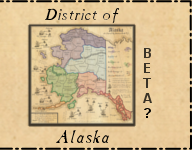 I redid all of the text, bridges, borders, everything. The text for the terts is as small as I can go without the font looking like crap, and it's as large (and spaced) as much as it can without overlapping border lines and other names. This means some of the areas are tight, but there are no overlaps, except for a couple of the third 8's in the 888's. 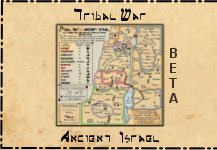 - Changed the second Elon to Kerioth (Judah region), as per BluU's original suggestion. Last edited by Seamus76 on Sat Dec 15, 2012 12:40 am, edited 1 time in total. Seamus, you still need to make the river Jordan and the sea of Galilee the same as the impassable rivers. Only have the Dead sea terts different, but all other water needs to be made the same. Right now, only the tributaries are impassable according to the legend. The river between Ijon and Hazor you don't need as you have a bridge connecting them and Ijon and Kedesh already connect. - Removed the river at Ijon. - Updated the Jordan River and Sea of Galilee colors to be like all other impassable rivers. They are all now the same. Seamus, I think the "Jordan River" text could use some kerning. Maybe make it bold and move it in a way so it's not touching the edge of the river. isaiah40 wrote: The river between Ijon and Hazor you don't need as you have a bridge connecting them and Ijon and Kedesh already connect. And if you still want to use Gath you can switch Hadesha or Libnah to it.